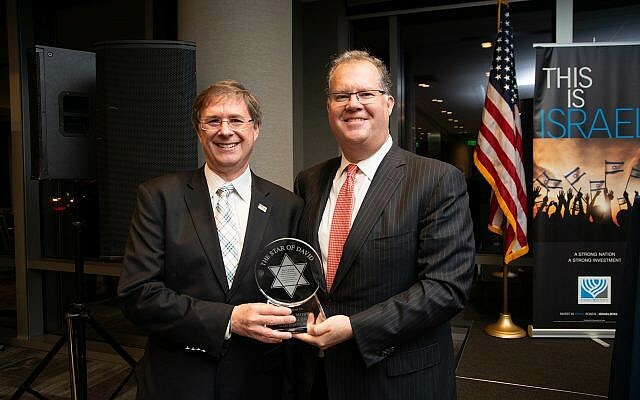 Israel Bonds for the Southeast region recognized Atlanta Jewish Times Owner and Publisher Michael Morris as the 2019 Star of David community award recipient. 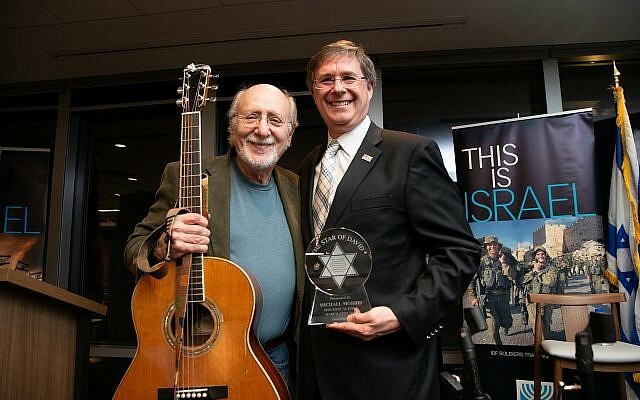 Musician Peter Yarrow poses with award winner, Michael Morris. The Keynote speaker is Israel’s U.N. 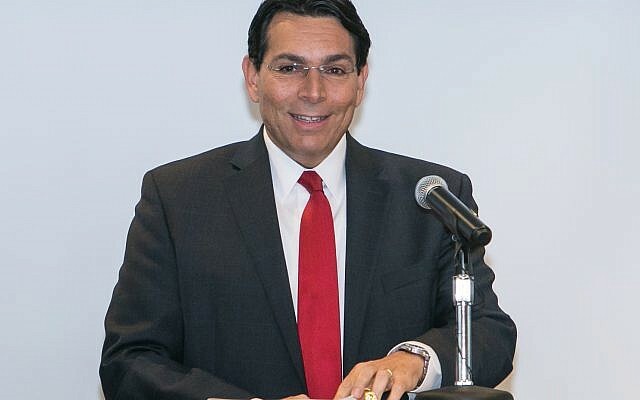 Ambassador Danny Danon. Evan Fishman presents The Star of David Award to Michael Morris. 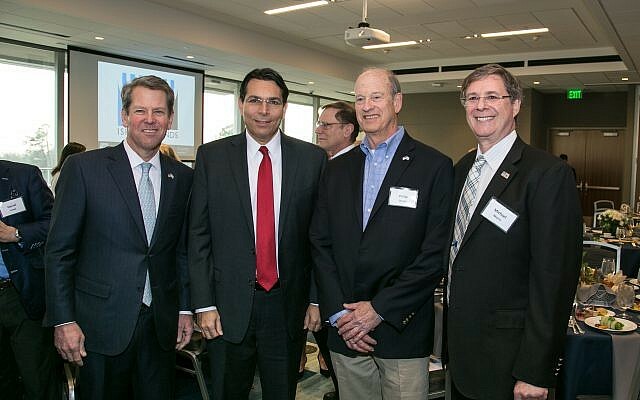 From left: Governor Brian Kemp, Israel’s U.N. Ambassador Danny Danon, Philip Jacoby and Michael Morris. Michael Morris with Ambassador Judith Shorer. From left: Ken Goldberg, Rabbi Peter Berg and Brad Young. 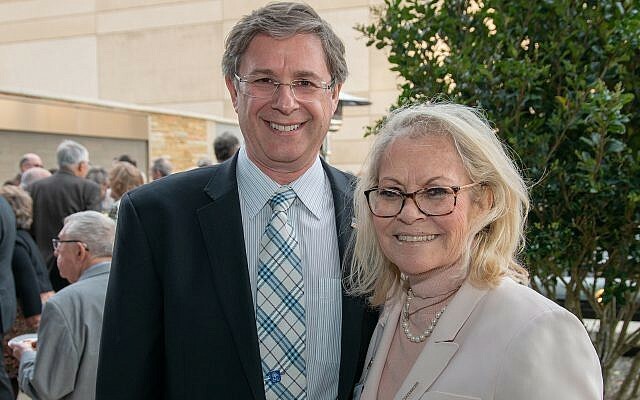 Israel Bonds for the Southeast region recognized Atlanta Jewish Times Owner and Publisher Michael Morris as the 2019 Star of David community award recipient. A festive dinner and reception was held at City Springs on March 13, at which $3 million was raised for the organization. Morris was honored for his longstanding support for Israel, his passion for the Atlanta Jewish community, and for his leadership at the AJT. He is known most recently for staging the resoundingly successful first Atlanta Jewish Life Festival, where more than 4,200 from a cross-section of the Jewish community gathered at the Georgia Aquarium. 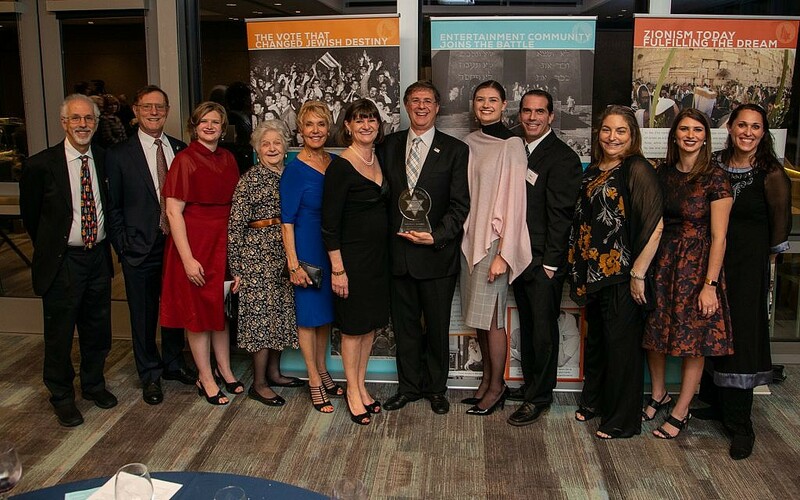 Receiving the Israel Bonds honor, Morris followed a long list of past honorees and community leaders such as Home Depot co-founder Arthur Blank, Gov. Nathan Deal, The RADCO Companies CEO Norman Radow, and Aprio Managing Partner and CEO Richard Kopelman. 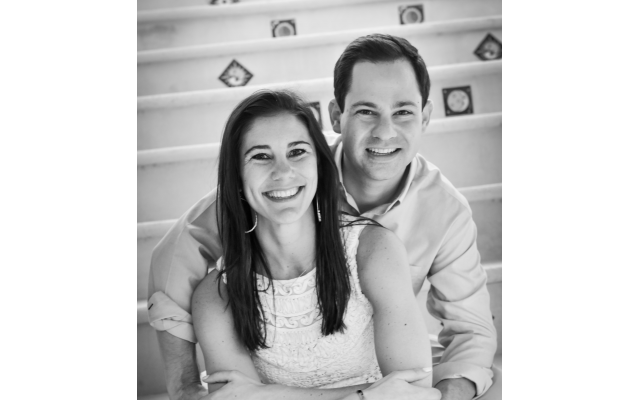 “Michael is the most committed and passionate lay leader I have even known. 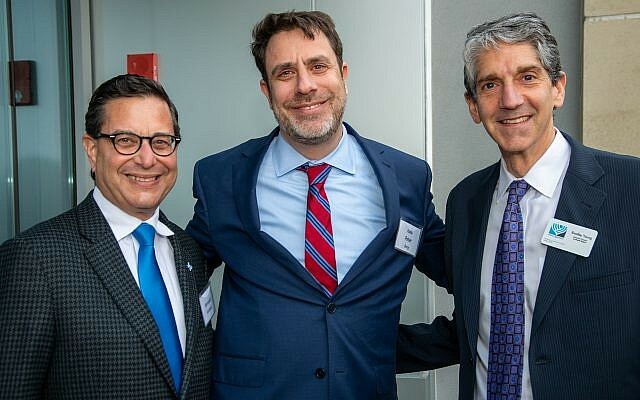 It’s our honor to celebrate him,” said Jay Feldman, managing director of the AEPi Foundation, for which Morris is chairman. From left: Gary Shrager, Fred Marcus, Jacqueline Morris, Barbara Ward, Felice Goldberg, Belinda Morris, Michael Morris, Lydia Morris, Gary Morris, Jaimi Morris, Alexandra Morris and Stacy Morris. Three of Morris’ four daughters, Jacqueline, Alexandra and Lydia, were on hand to support Dad. Jacqueline said of her father, “Whatever he commits to, especially in the Jewish community, he makes a top priority.” Alexandra took a lighter approach. “Besides being a good mentor, he was a fun dad. My friends thought he was cool and liked him better than me.” Another branch of the Morris family made a surprise visit from South Florida. 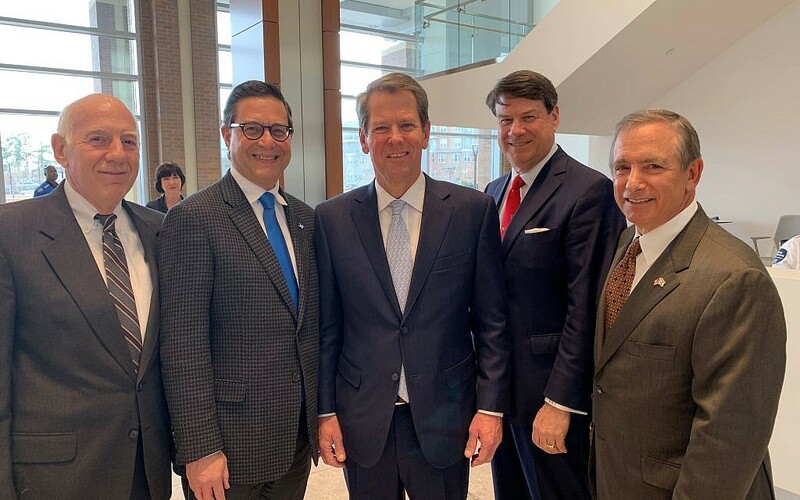 From left: Ed Goldberg, Ken Goldberg, Governor Brian Kemp, Sandy Springs Mayor Rusty Paul and Chuck Berk. U.S. Chair of Israel Bonds Kenneth Goldberg flew in from Dallas to honor Morris and introduce the keynote speaker, Israel’s United Nations Ambassador Danny Danon. He focused on Israel’s role in the U.N. “We all know that Israel is held to a different standard. The Security Council wants to accuse us of war crimes and not address Iran or Syria. … there is hope in that much goes on behind the scenes. Watch what Arabs countries say versus what they feel. They want to keep quiet our acceptance (on some levels.) Note that Israel has diplomatic relations with 160 nations.” The biggest reaction came from his work with U.S. Ambassador to the U.N. Nikki Haley and singing “Hatikvah” with her in a crowd of 3,000 Jews. Ed Goldberg, Atlanta Israel Bonds general chairman, commented that Danon has the hardest job in the U.S. He was pleased to announce that the Southeast invested close to $100 million in bonds in 2018 and $59 million had already been committed in 2019. Executive Director Brad Young reminded us that Bonds fuel the engine of Israel’s growth. “And we have never, ever defaulted.” He announced a new $5,000 bond edition that he predicted would sell out quickly. 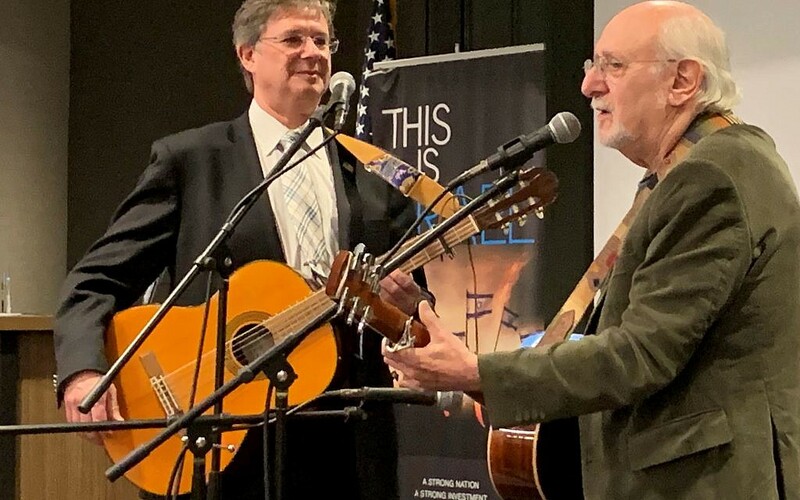 World-renowned Peter, Paul and Mary Trio guitarist Peter Yarrow delighted the audience when he opened with “Welcome esteemed mishphachah” (Morris family) to “shep nachas” for Morris. He recalled his appearance at Chastain Park with “‘the towering shikse’ Mary, who insisted on truthfulness even if it was painful … during this time of our country’s vitriol.” He performed an emotional song he wrote about differences, “Don’t Laugh at Me.” And he tried to set the record straight that the classic children’s hit “‘Puff the Magic Dragon’ was not about pot (laughing), but about a child getting bar mitzvahed. … A child’s life cannot forever stay in Honahlee.” Yarrow, who is Jewish, funds a music program in Israeli schools. Morris began by joking that the only person in the U.N. who misses Haley is Danon. Morris recently had dinner with Haley in Boca Raton, two nights before the Bonds event. He recognized his fellow AEPi brother Rabbi Alvin Sugarman, whose first date with wife Barbara was at an Israel Bonds dinner. On a more serious note, Morris expressed his father Bernie Marcus’ “footprint in giving” started when he was at Handy Dan, the home improvement company where he was CEO prior to co-founding Home Depot. Morris recounted that in 1973, during the Yom Kippur War, he was raising money for Israel. He recalled that in early 1960s his grandparents could not even visit the Kotel. We can never take Israel for granted,” he said. Morris performs a duet with Peter Yarrow of the group Peter Paul and Mary. “Israel is close to my heart; it is my personal home away from home. It is not only important for me to support my extended family there, but it is important for me to teach my children, here in Atlanta, that Israel is a valuable piece of my Jewish identity. Not shy about asking for the order, Morris urged the audience to support the Atlanta Jewish Times by buying a $65 annual subscription as a vital link in Jewish engagement. By a large show of hands, he seemed to be preaching to the choir. Avid fan and talented musician, Morris had 50 years of practice playing “Puff the Magic Dragon” privately before taking the stage with folk music legend Yarrow. The audience rose to its feet to link shoulders as the performance astonished and delighted. Morris more than held his own as a balance to Yarrow with his strumming and melodious tenor pipes. It was indeed magic for this crowd of admiring Jewish dragons. Event co-chairs were Belinda Morris, Kaylene Ladinsky, and Renee Werbin. Israel Bonds has exceeded $1 billion in domestic sales each of the past six years and expects to do the same for 2019. The Finance Ministry of Israel has requested a goal of $1.1 billion in sales in the United States.